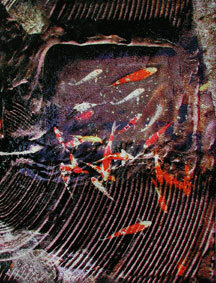 Basin, 2000, 32 x 24"
Spun-bonded nonwoven materials made of polyester or polypropylene can be used as a base for creating a customized printing surface. A nonwoven fabric will not curl or warp and can be textured with a heavy-bodied acrylic gel medium, paper, and varied collage materials. 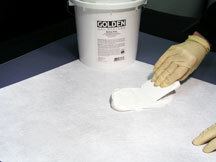 Prepare nonwoven fabric for the printer by applying a white matte precoat. If you keep your additions close to the surface, the nonwoven fabric will feed easily through most printers, especially if you use a straight paper path. Warning: For desktop printers, be sure to use white matte precoat on any variations to the following process, to avoid pizza-wheel tracks. Step 1. Break the fabric’s surface tension by misting it with soapy water. Then, with a plastic scraper, work a coat of molding paste into the fibers to create a bonding surface for the precoat. Step 2. Be sure that ridges or peaks don’t exceed the printer's clearance. Press down to remove problem areas. 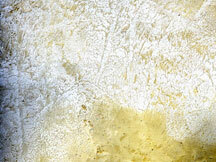 When the surface is thoroughly dry, use a sponge brush to cover it with white matte precoat. Step 3. Let the surface dry overnight before printing, as in this example of treated and dried polyester. 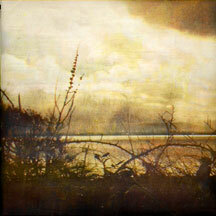 • To create a transparent substrate, start with a sheet of clear plastic or polyester film. 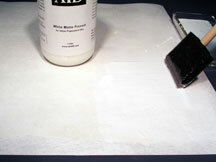 • Use the acrylic gel medium as a glue to collage paper and fabric to the surface. • Experiment with a variety of materials--sponge, foil, folded cloth, plastic bag, bubble wrap, combs--to create interesting textures. Paint a coat of acrylic gel medium to texture into, and/or dip the texturing materials into the medium and pat them on the surface. • Paint on the surface with metallic, pearlescent, or interference pigments, and apply a clear precoat to give a glow or a color shift to the final printed piece. • Use pumice, sand, or glass-bead pellets to add texture to a surface. Warning: This last tip will not work with pizza wheels. Tip • If you are unhappy with a print you’ve made, you can save the substrate by washing off the print and its precoat with water. Let the substrate dry before precoating again. However, if you used white matte precoat, it can’t be washed off, but you should be able to recoat the surface by applying more layers of the precoat. 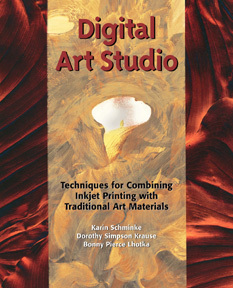 Taken from pages 38 -39, DIGITAL ART STUDIO: TECHNIQUES FOR COMBINING INKJET PRINTING WITH TRADITIONAL ART MATERIALS by Karin Schminke, Dorothy Simpson Krause, and Bonny Pierce Lhotka. Copyright (c) 2004 LSK LLC. Published by Watson-Guptill Publication. Reprinted with permission from the publisher.